Our work time is regulated by hours, weeks, and months. Organising our work activity temporally (that is, by time) is a challenge that can be conquered with a diary (of the datebook kind, not the daily record of experiences). With a digital diary, it becomes easier to manage an emerging or changing schedule, such is the nature of modern work practice that attempts to include inherently changing acts of creativity and innovation. When I was an employee in a large organisation, our digital calendars were visible (with some concessions for privacy) to other staff members. As a dedicated user of the calendar, I often found others commenting that according to my calendar, ‘You are so busy’. I was bemused and wondered: Were people with empty calendars considered to be ‘not-busy’? The technique explained in this blog is about making visible how-you-spend-your-time, and enabling flexibility to better manage what, where and when factors of your activity. My diary is my temporal space made visible. It enables me to map my intentions about time. I create and shuffle around blocks of time to firm up what my schedule will look like, while also experimenting with what it could look like. With a digital diary it’s particularly easy to drag and drop entries; and to append extra information to capture the meaning I have given certain entries, for example: Tentative, (In) CBD. Then my diary appears clean, and (re)organised – no whiteout or erased pencil lines in sight! Putting entries in my diary gives me a schedule to follow for the day. While my days might not have a regular routine, I am assured a degree of order as important things needing my attention are factored in. Many of my entries are not appointments with others, but simply an entry for me to work on a specific activity. 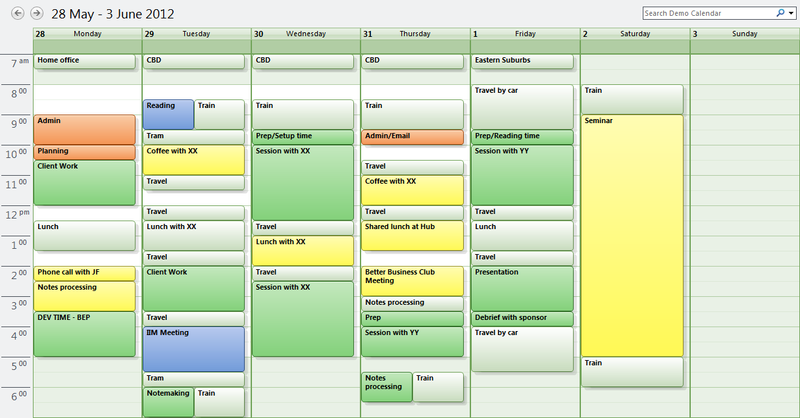 Rather than work from a general To-do list during the day, I work from my calendar schedule of activity. Many of these activities have an associated and specific To-do or next-action list which is my exclusive focus during the allotted time. Entries in my diary are an agreement with myself about what I am going to focus on, and help me to focus on one thing at a time. I’m not a fan of multi-tasking, but on occasion my thoughts are scattered and I free them from the leash, within a boundary of ‘Planning’ time or ‘Admin’ time – simultaneous chaos and order! Making diary entries also enables me to more accurately forecast how much time activities will need, particularly those that are spread over multiple days, and to ensure sufficient time is reserved. In addition, I can better evaluate when to sequence individual activities in context of other things, e.g. other activities, my location, and my anticipated energy level or attention capacity. While not an Activity per se, I’ll often add entries to my calendar for deadlines or time-sensitive milestones. Because I am following my schedule for the day, it’s handy to have time-sensitive things co-located with my actions, in case I need to re-evaluate action priorities. Start to put this time in your calendar. Particularly when entering linked activities. 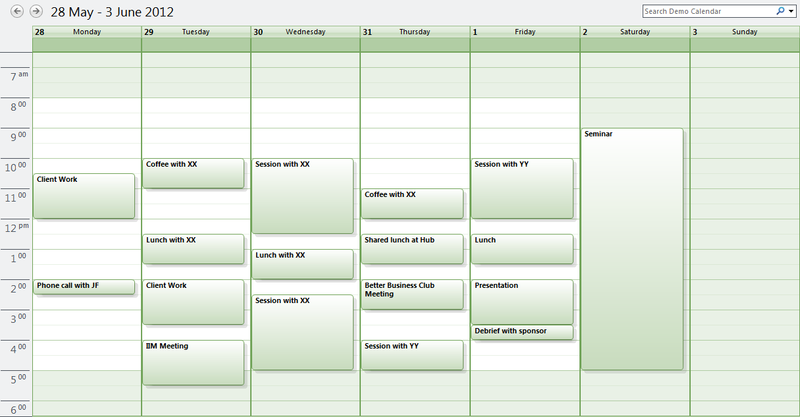 For example, after creating a Meeting entry, add Travel time to either side of the Meeting entry. Or, when creating a Meeting entry, add entries for Prep/Reading time and Note Processing time in close proximity to the meeting entry. See examples in Calendar 2 below. While I am advocating filling a digital diary with entries, I am not advocating filling every waking moment with scheduled activity. Leave space for the unexpected that might better deserve your attention, or for spill-over when you’ve underestimated the amount of time needed or things have emerged with unanticipated complexity. You might need to schedule ‘contingency’ or ‘open’ space in your calendar, simply so you (or others if you are sharing a calendar) don’t mistake it for Free-to-schedule-any-Activity time. Dov Frohman (with Robert Howard) in the book, “Leadership The Hard Way: Why Leadership Can’t Be Taught—And How You Can Learn It Anyway“, advocates scheduling ‘day-dreaming time’ where you engage in “loose, unstructured thinking with no particular goal in mind”. An approach they recommend for dealing with complexity and ‘fuzzy’ problems. 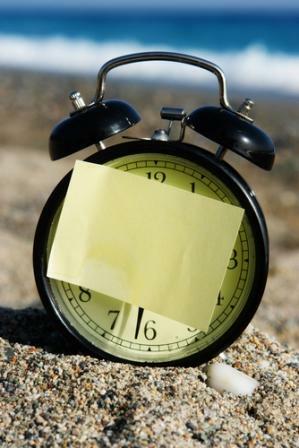 One of my students shared this technique: she schedules a calendar entry called ‘Lucky Dip’ – the time is reserved but the activity is unknown. She has a bag in which various activities, both delightful and necessary, are written on strips of paper. When the appointed time arrives, she dips into the bag without looking, selects what she will do, and does it. Another type of time you might consider scheduling is disconnected time, i.e. time when you don’t access the internet, read your email, look at Twitter or other social media sites. A practical way to support day-dreaming time! Organising your temporal affairs effectively means you can utilise your time wisely and for greatest benefit. Effective use of time requires knowing what you spend your time doing, as well what you don’t spend your time doing. Hopefully the suggestions in this blog can help you better align your reality with your intentions. This entry was tagged activity, calendar, diary, focus, manage, organising, Plan, technique, time. Bookmark the permalink.